As for the enticing concept of “helicopter money,” my impression is that many observers are using the term with no understanding of what they are talking about. Despite the uninhibited imagery it evokes, “helicopter money” is nothing but a legislatively-approved fiscal stimulus package, financed by issuing bonds that are purchased by the central bank. Every country already does it, but the size is limited to the willingness of a legislature to pursue deficit spending. Central banks, on their own, can’t “do” helicopter money without a spending package approved by the legislature. Well, at least the Federal Reserve can’t under current law. To some extent, Europe and Japan can do it by purchasing low-quality bonds that subsequently default, but in that case, it’s a private bailout rather than an economic stimulus. See, those central banks have resorted to buying lower-tier assets like asset-backed securities and corporate debt. If any of that debt defaults, the central bank has given a de facto bailout, with public funds, to the bondholder who otherwise would have taken a loss. So almost by definition, low-tier asset purchases by the ECB and Bank of Japan act as publicly-funded subsidies for bondholders, rather than ordinary citizens. My sense is that if the European and Japanese public had a better sense of this, they would tear down both central banks brick-by-brick. The current half-cycle market advance is remarkably long-in-the-tooth. There little basis for investment at these valuations - only speculation. Without a strong safety net, that speculation amounts to an attempt to gather pennies under a chainsaw. In recent weeks, we’ve heard some rather ignorant talk of an ongoing “secular bull market” that presumably has years to go. 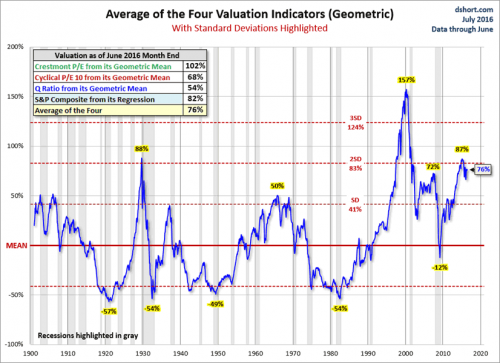 Unfortunately, these analysts don’t appear to recognize that secular bull markets have typically started from valuations literally one-quarter of their present level (see 1949 and 1982), and far below those observed at the 2009 low. With the exception of the 2000 extreme, every secular bull market has died before reaching even the current level of valuations. Moreover, even if this were a secular bull, one would still expect a cyclical bear from current extremes. By our estimates, investors can expect to scrape out scarcely more than 1% in nominal annual total returns in the S&P 500 Index over the coming 12-year period. We expect that all of this will be from dividends, and that investors will experience a steep roller-coaster of draw-downs and volatility in the interim. The index itself is likely to be below current levels 12 years from today. Even the lowly returns available from cash will likely serve investors better. Of course, we expect the discipline of investing in alignment with the market’s expected return/risk profile, as it changes over the course of the market cycle, to do far better still.